One of the phrases coined during the debate over President Obama’s health care overhaul was the “young invincibles,” referring to the large share of young adults who did not have health insurance because they thought their age made it less likely they would get sick, or just were not in a position to afford coverage. A Census Bureau report last September said 27.7% of those aged 19 to 25 were uninsured — about the same number for the 26 to 34 age group, but significantly higher than older Americans. For the 19 to 25 year olds, the 2011 percentage of uninsured was a decrease from 29.8% in 2010, attributable in part by the new health care law which allows families to keep children on their health plans until age 26. 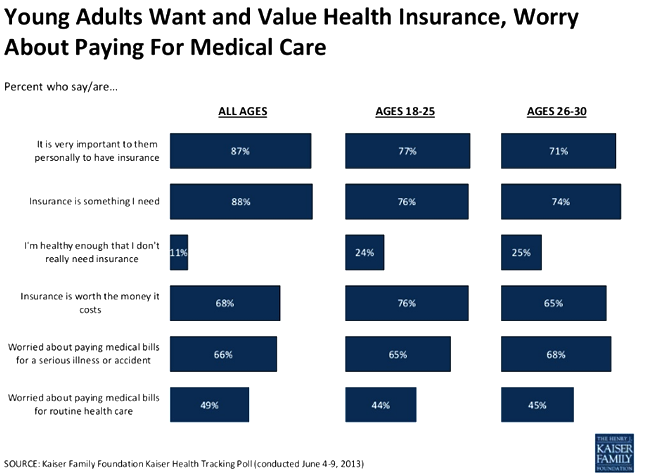 A new Kaiser Family Foundation Health Tracking Poll, from which this chart of the week is taken, suggests that, despite the “invincible” tag, young adults are worried about their ability to foot medical bills. More than three-quarters of those ages 18 to 25 regard health insurance as something important for them to have, something they need and something that is worth the cost. About two-thirds of young adults — roughly the same number as the general population — worry about medical bills that might result from a serious illness or accident. The survey, conducted June 4-9, did find a higher percentage of young adults than the overall population who believed they were healthy enough and didn’t really need insurance, but this still only constituted 24% of their age group compared to 11% of all adults.